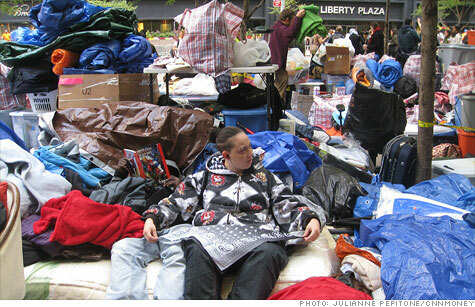 A scene from Day 19 of the continuing Occupy Wall Street protest. NEW YORK (CNNMoney) -- When Occupy Wall Street began on September 17, the protest consisted of a few hundred people speaking out about corporate greed and inequality. They practiced tai chi in a park near Wall Street, painted homemade signs and discussed what their demands should be. Now, almost three weeks later, the once-haphazard movement is growing larger and more coordinated. Hundreds of people have been arrested. Large labor unions, including the AFL-CIO and SEIU, have joined in. When new arrivals turn out, volunteers swiftly equip them with donated sleeping bags and food. Dozens of cities nationwide have launched their own "occupy" protests in solidarity. Like the "Arab Spring" uprisings that inspired its tactics, Occupy Wall Street is evolving. From the beginning, organizers -- including activist magazine Adbusters, which hatched the idea and put out a call for participants back in July -- have said they hope protesters will occupy Manhattan's Financial District for two months. On Day 1, no one knew what that would look like. Fast forward to Day 19, and Zuccotti Park is loaded with makeshift camps and organized "stations": medical, food, legal, media, security and more. Food and blankets have come in from donors all over the nation, said Matt Ingram, who was volunteering at the "Comfort" station on Wednesday. "It's incredible to see the outpouring of support from people who can't be here," said Ingram, 28. "It reminds you that there's still humanity, and that people are inherently good." The support from labor unions, which began signing on in late September, has brought hundreds more to the scene. Representatives from the groups have garnered attention by sending press releases about the protest. "It brings us more people and more attention," said one twenty-something man who declined to give his name. "I don't think that their cause is the same as most people here. But we're all angry about something, so I guess it's OK."
The crowd and atmosphere shift depending on the day of the week. It's tough to leave your day job for two months straight, and so the number of protesters dwindles on weekdays, when those present tend to be college students, the unemployed and retired people. Weekends ramp back up again, with a larger and more diverse crowd turning out. Day-by day highlights: Before the protest began on Saturday, Sept. 17, the New York Police Department closed off Wall Street and barricaded the iconic bull on Broadway. A few hundred protesters gathered around the bull and in nearby Zuccotti Park, with the crowd growing to about 500 by the evening. On Day 3, a misty Monday, the number of protesters had fallen to about 125 people. But the following weekend brought hundreds more people -- and the first spate of arrests. The NYPD closed Broadway that Saturday -- Day 8 of the demonstration -- and protesters marched down the avenue. Photographer Daniel Fitzsimmons said that day that "a protestor dropped to his knees in front of the Chase Bank on Wall Street, saying the bank took his parents' house. He was later arrested." On Day 15, this past Saturday, the tone changed sharply. The protesters extended the rally to Brooklyn Bridge, where hundreds were arrested and later released with tickets for blocking the roadway. "Over 700 summonses and desk appearance tickets have been issued in connection with the demonstration on the Brooklyn Bridge ... after multiple warnings by police were given to protesters to stay on the pedestrian walkway," said NYPD Deputy Commissioner Paul Browne. Browne said authorities had warned protesters they would be arrested. Bridge traffic heading to Brooklyn from Manhattan was shut down for several hours. A few hundred people remained at Zuccotti Park on Day 19, Oct. 5, preparing for a late-afternoon march from Foley Square to the Financial District. Meanwhile, an Occupy Philadelphia is slated to launch Thursday, joining protests in Los Angeles, Boston, San Francisco, Denver and Chicago, among other cities. The protest has drawn some criticism for its lack of concrete goals. But the fact that Occupy Wall Street is still going strong 19 days later means it's done what it set out to do: Draw focus to the concerns -- and anger -- many Americans have about the country's growing economic gap, plant the seed of an organized voice, and let the protest evolve naturally. "We're showing that 'we the people' really are here, present, from all walks of life," said Tammy Bick, 49, an unemployed former medical secretary. "It's a meeting of the minds and a voicing of our issues. That alone makes it the best single experience of my life."